Everyone who deals with an art of photography knows that it is extremely important to be in the trend. 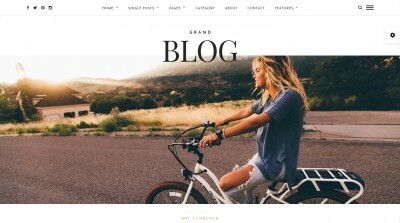 We offer you latest and hottest Word Press themes of 2015, which will suit any photography-related website and attract for you even more visitors. New completely modern and comfortable in use design is one of the best options to meet 2016 with. Stunning galleries, bright main pages to show off, minimalistic and strict design – these qualities of following templates will definitely help you to significantly increase the status of your website in the coming year. Check our themes to be number one; there are no other secrets of popularity except for good show! Andy Parker`s theme is a perfect choice for any photographer. Firstly, because of a large amount of options to customize a portfolio. You have four types to play with; this will definitely come in handy with different photo projects where you will be concentrating on various aspects of images. If you ever dreamed of a simple yet powerful tool for uploading your works – be prepared to rejoice! Special feature of the template by Andy Parker is an advanced tool for images manipulation, which helps with ratio choice. Say “goodbye” to previous problems fitting your photo in the gallery! Also, the theme offers you a popular bonus – a customizable menu. Now it takes just a couple of clicks to get the desired view of the important part of good website. Stretched? Centered? Try them all! Nowadays “first class” for a website is a premium landing page. 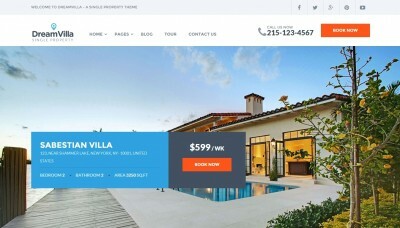 In the Panama theme main accent is on such important element, which attracts the attention of newcomers and lets you increase the visitors count! Perfectly done and beautiful animations of landing page emphasize the brevity of your website. 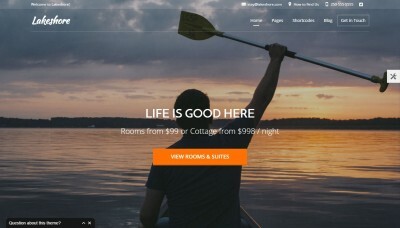 You may choose out of six various landing pages styles, play with floating column variants, and pick up the best design for portfolio grid, depending on your needs. Simple, fast, and accurately. With a modern and useful builder for pages it is not a problem to create any page from scratch. You want to protect a gallery with a password? No problem! Create some special image categories in a couple of clicks. Unique design tends to be among the finest ways to draw some attention and, as a result, visits on the website. Photographs are artists, so it is important to think about set out; big bright images – fine example! This is the main feature of Ichiban theme. Pages of the template are divided into two parts, which is very cozy to use while viewing portfolio pages or galleries collection. Such an elegant design makes every minute of work with the website pleasant and comfortable! You may choose out of 4 types of gallery and portfolio styles for best experience in your individual design. Be creative and this will result in huge success. The theme is fully SEO optimized and ready for translation – quick settings run and all is ready. The Sunday template concentrates on beautiful most-of-the-screen galleries. A perfect choice if you have multiple portfolios with a huge amount of images to show. Easy navigation and minimalistic yet powerful grid – reveal all your aces at one time! As a special feature use full-screen galleries powered with zoom for best user experience while browsing your portfolio pages. Eye candy: good old method to make your visitors satisfied. The Sunday theme includes three special demo designs, which you can even mix for desired style. This template is ready for WooCommerce integration, so the installation of shop area will take just a couple of minutes. Social sharing, responsive design – all is included. Try it and you love the way the template works! The Lightbox theme is a real constructor. It allows you to manually choose the style of images grid, the margins between photos and other sizing. This template ideally suits any project, which wants to be unique or already has a design to implement. There are also 3 included designs of grid and 6 designs of gallery as a bonus for you! Even if you don’t want to create presentation from scratch – for the Lightbox it is not a problem. You can even use a video as a gallery content. As a bonus you will have a special contacts page with perfectly designed layout and modern slider to use within website. You want more? 28 fully animated icons for social needs with a full support of touch devices. If you need something universal – try Kinetica theme. It is a perfect example of multipurpose template for WordPress, which combines slide show with other features for most informational interface to use. Visitors will be glad to see your promotions right on the main page! A good collection of different galleries styles with even mixed photo and video slider. You like to play with menu settings? Choose out of 6 variants, they will definitely satisfy every web master. Note that you have two global theme options to use: dark or light. It really affects the appearance of Kinetica theme, so you can use an appropriate variant for your photos style. Template is also fully responsive to use on all devices and also supports YouTube HD videos, nice addition! Parallax effect is a modern feature that makes any presentation or main page better. Photographers use a lot of images in high quality, that’s why you should try an interesting theme – Borderland. It is very universal; you can take a look on 12 completely different templates and choose the most suitable. You want a portfolio right on the front page? Or, maybe, you prefer to introduce yourself firstly? Don’t worry, the template can do all these options. Fully e-commerce optimized; with great and customizable parallax effect to use and impress your visitors. If you prefer modern and powerful themes – take a closer look at Borderland. Do you like full-screen photos on the website? So does Photo Me WordPress template. 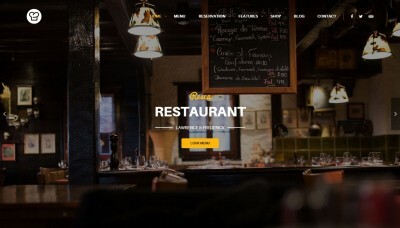 A great feature of this template is a collection of styles, which can be applied in one click. You have 8 global demos and more than 50 galleries to try! Use live customizer for best experience and quickest editions on current design. All templates are easily and fully customizable, choose from tons of different options for unique website layouts. People want to be sure that no problems will occur with a particular product and that’s why this template offers a great customer support, so you can quickly solve any issue. A mix of modern trending features – Moon theme – is an example of an up-o-date website design. This template characterized by the full adaptation to your needs. It will follow any color settings and options of your photos, thanks to the special built-in add-on. Also, take a look at surprisingly simple, but incredibly useful, panel design; you may tell a story on each photo, which helps you to increase an involvement of visitors into your website idea! As a bonus you can put your images on a beautiful map to show location information; it is a very modern feature. Be more cozy to client with appointment widget, special contact form, and ready-to-use pricing plans – full informational support of customers. Sometimes you have a more complicated project, which needs more detailed description. The Leore theme for WordPress is perfect for this. Main quality of this template is a squared design that includes informational spaces to add a qualitative description of what you want to show. It is also not a problem to create your brand new website, thanks to the visual composer. Drag and drop – your project is ready! The Leore is very SEO friendly; you can easily advertise and improve the rating of your website. Need translations? Not a problem as well. Theme is fully integrated with Google Maps, you can use them, for example, in Contact Us area. If you need to sell some great shots – use the price table; it will ideally suit because of customizable design. Emily is an interesting WordPress theme, which is simple and clear, as minimalistic thing should be. It lets you use some concentration effect on the website: zoom effects, full-screen view. Think about galleries; Emily will deal with everything else. The theme consists of many portfolio types that you can adapt to any photos collection. Either if you like to use masonry-styled or horizontal grids you will find a perfect solution to any design problem. Pure, white, clean, and stylish – must have for any serious photographer, for sure. Emily is a modern theme and supports CSS3 and HTML5; SEO-optimized, works with any touch device. Your ideal partner for an images showcase! It is very important to draw attention from the very beginning. Montage WordPress theme makes it perfectly. You may choose out of four unique and perfectly selected main page appearances for best experience. Try them one by one, they are really great! Sometimes you may use just a big fancy and bright static image. Or maybe live video suits best? Anyways, you can always try a slider. Besides that take a look at portfolio styles, everything is fully customizable and responsive. Also, Montage template works very smooth, thanks to clean code and AJAX elements, so don’t worry about performance – everything will work as a charm on any machine! Theme is SEO-optimized and ready for translation. It’s clear that now we live in era of wide screens. New resolutions demand new websites and we should meet the demands of modern times. This is a purpose of Talent theme. It is designed specially for wide displaying, although offers you classic yet minimalistic and cozy interface of portfolio pages. You can use 5 different designs for photo collections with an option to build full-screen galleries with zoom and pop-up effects! The portfolio page is full of various options for detailed tuning; use two global layout settings for wider preferences. Galleries, which are protected with passwords, perfect documentation and support of various devices – this is the Talent. 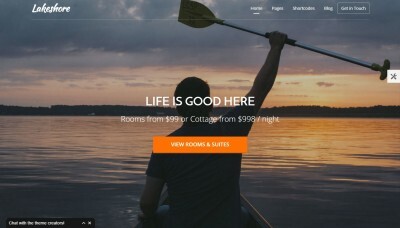 Meet the WordPress theme of tomorrow – Coastline. Unique and clean appearance, which is very strict and “cubic”, full support of best add-ons, and enjoyable design; prepare to greet new visitors! The main feature of Coastline is flexibility. Try portfolio designs for many different photo collections or use infinite scroll of main page to impress website guests. Template adapts to gallery type, so you can be sure that everything looks harmonically. Don’t forget about custom widgets to add on your website; Coastline supports tons of them. The first and brightest example is JetPack, a gallery from which is extremely popular at the moment. Be modern, be unique, use Coastline theme. Flat design, various showcase types for your photos – this is the Lens WordPress theme. The template is multipurpose, but aimed on satisfying photographers, depending on their work type. Artist have to show their creativeness in many ways. Sometimes full-screen is the best option and sometimes you need a grid for small icons or preview or even a journal to add some informative description to each object. Lens is able to help you in every way. An eye candy of smooth animations or unlimited color choice is a good bonus, and it’s all yours. You want more? Powerful settings panel for quicker options apply is here to help. Social friendly, with support of translation – try Lens if you want to be in trend. Milo is the theme, which seems to be a symbol of simplicity and minimalism. If you prefer to lay stress on content and not the actual design of website – this is your choice. You will find just must have things in this theme. The main layout is divided into two parts (for best user experience) with menu on the left and actual photos or other images centered within right part. It is possible to choose from full or grid displaying of your collections. The theme is modern and supports YouTube and Vimeo besides editable design elements, so you can be sure that any image or video will perfectly suit the current style. A perfect example of full screen oriented theme is the PhotoReactive. It is made, first of all, for qualitative shots and images, to show each side of the photo very close. You may also choose a normal style of showcase if needed, which looks great too. Use photowall feature for grid of photos with descriptions for better and more simple navigation or full screen photos and videos – it is up to you. Powerful preferences part of the template is a real add-on that makes things easier to change for your needs. If you need a shop support – PhotoReactive is among the best even here! 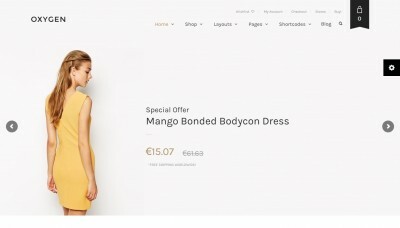 Fully integrated WooCommerce shop extension with SEO optimization for a great advertisement campaign. Tempo WordPress template greets the visitor with a stylish presentation of best photos. The theme is minimalistic and modern and will satisfy the needs of any photographer, because of additional features. The Tempo uses revolutionary framework in its work, which called Zoom. It allows you to change many details of theme appearance to be sure that your website is unique and really beautiful. You can also use two global color schemes to make some global fixes and change header style; easy as a piece of cake! This template is very responsive and ready to work on Retina displays. By the way, you may choose out of 3 different aspect ratios of photos showed to find the best way to impress visitors with your shots. 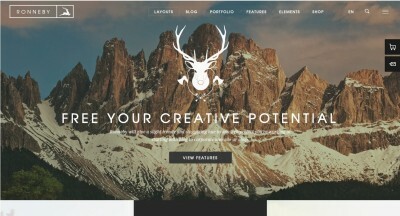 A mixed experience of full screen main page and customizable gallery – Inspiro theme. It uses a special gallery module for a perfect tuning and settings change of your portfolio, so you can just sit back and relax while watching your visitors count increases. The theme is based on famous Zoom framework to make work with template more simple and intuitive. Just set the style of landing page to video or full screen presentation, choose a gallery type – and all is done! Now you need to fill the portfolios with images and enjoy the results. Inspiro works great with WooCommerce and got some special widgets to help you. Full translation and easy customization are also here, of course! Photogenic is a pro WordPress theme for any photographer from novice to real master. It concentrates on particular images and their stories, but also show a perfect example of cozy navigation and menu style. Try it to show your shots to the world! The main feature of the template is main page collages. Just choose a header and a collection. Template works with images like a charm: aspect ratio, stylization – all will be set simply, quickly, and qualitatively. If you need to write a line on your projects, Photogenic is fine for such task. Integrated blogging support makes writing and publicizing much easier. This theme is responsible and can be used on any device. Besides, translate it into any language to widen the auditory; everything works out-of-box!